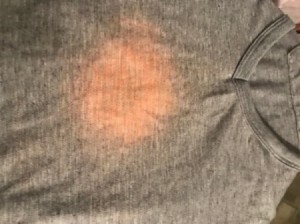 What is causing these pinkish orange spots? The clothes did not have them before they went into the washer and dryer. I don't use bleach or fabric softener. It happens randomly every once in a while and ruins my clothes. This shirt was only worn once and is now garbage. You may have rusty water, or some chemical in the water that makes it brown at times. I don't know what detergent you use, but when I stopped using Tide a few years ago, I had the same problem. I attributed it to the detergent which was either Era or Sun something touching the clothes before the water circulated/suds it. I went back to Tide and it hasn't happened since. Have you been using any new beauty products? I had deodorant stains in the wash and it made my shirt yellow, so now I use a natural deodorant and haven't had any problems. It might be the water. Maybe try running a vinegar rinse cycle. It sounds like rust in your water that could be caused by well water pipes/pump, washer drum, hot water heater/pipes, or older pipes in your house. You do not say if this is a "new" house/apartment (to you) or how long this has been happening so solutions may be mainly guessing. I have seen this happen (sporadically) when a home has well water and the only solution there is either new pipes in well (and maybe a new pump) or a very good water conditioner/softener and either one is usually expensive. You will have to read all suggestions/solutions and maybe see if any one of them could apply to your problem. If you want to try and remove rust stains from your clothes, do not dry them first. Heat stabilizes the rust stains and makes them nearly impossible to eliminate from any type of clothing. Immediately rewash clothes using a heavy duty detergent in clear water. Use a commercial rust eliminator such as Iron-Out or Rit rust remover. These items contain hydrofluoric or oxalic acid compound that loosens rust from most fabrics. Make sure these clothes are thoroughly rinsed because any acid remaining will deteriorate clothes. In addition, these rust removers are only intended for colorfast material or white clothing. If none of the suggestions sounds like your problem, I would suggest you capture a large jar of your water and take it to a store that sells water softeners and ask them to check it for you. Some stores will test it for free but others may try to sell you a kit. There are other places to have your water tested but some will be trying to sell you their system. There are also some government agencies that test water under certain conditions so check out your state. There is no way to stop the spotting until you find out what is causing it so check out some of the other suggestions as your water may still have more rust deposits going into your washer. It looks like rust stains. see if any of the enamel has worn off the inside surfaces of the washer or dryer.